Welcome to 2019 West Auckland Community Education Programme. 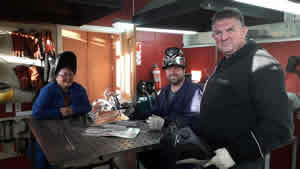 Adult and Continuing Education West Auckland provides information on several Educational Providers in Waitakere City and coordinates the resources of Rutherford College, who are committed to providing lifelong learning opportunities and work closely with other providers in the local area. This year there are over 300 courses available so take the opportunity to study a subject you’ve always been interested in, refine an existing skill or branch out into unexplored territory. All of our tutors are qualified in teaching to adults – many of them specialists in their particular field – and you’ll find that learning is easy in a relaxed sociable atmosphere. Our 2019 programme has a range of family-friendly courses. These are designed for students 13 years or older accompanied by a parent or caregiver. Restriction dates may apply. We offer you a wide selection of courses, ranging from cooking, art, business, dance, music, languages and ESOL, to boating, gardening and photography. If your week nights are busy, our weekend workshops may suit you better. It is a good idea to register at least a week before the class start date advertised so that we have an accurate idea of those interested in that particular class. We would not want you to miss out.